One of the biggest headaches in preparing for an event, especially in student ministry, is the registration process. In order for me to get my group’s registration form turned in with our deposit, I first have to get students to register and collect their deposits. That can be a paperwork nightmare! What if all the registration details could be handled by families from home? What if most of the payments would be processed automatically online? 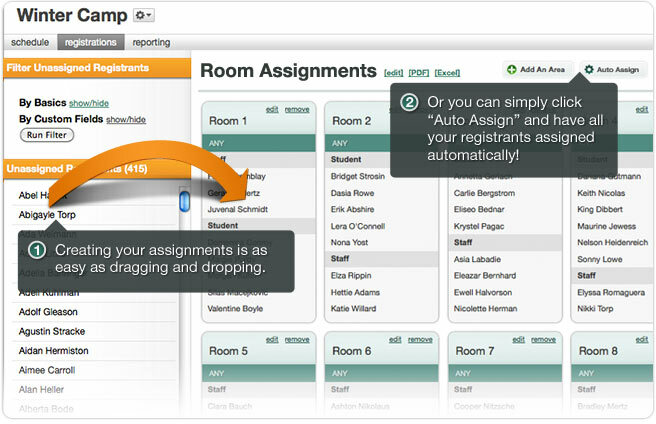 What if sorting students into groups or assigning to multiple vehicles wasn’t such a hassle? What if this was possible no matter what kind or size of event you were doing? It is now! Sound like an infomercial? It’s not, but it should be. We have only been using SmartEvents at our church for a few months, but already it is becoming a favorite resource for both staff and families. This resource allows you to post your event information online where anyone can view and register. If an event is free, there is no charge for using the service. If the event has a fee, you pay a small fee of 1.5%. (Keep in mind, as with any online registration tool, you also pay a percentage to PayPal and any other payment processing resource you use.) We only accept PayPal for online payments, to keep our fees at a minimum. People also have the option to pay by cash or check in person. We link the SmartEvents main registration page to our facebook pages and our main church website. People are loving this new system! No more wondering who has which form to turn in. You can easily track it and families can download it from the site 24/7! You can setup custom pricing (early-bird discounts, scholarships), easily setup groups for rooms or vehicle assignments (with a sweet auto assign feature), and can even include an event schedule. For folks who need help or who don’t have a good internet connection at home, we have a computer workstation setup in our lobby where they can login and register on site too. I’d love to hear your thoughts, comments or questions. This really has turned out to be a great tool for getting people registered for an event. And I haven’t even touched on all the custom question options, various ways you can customize and export data into helpful reports, and how they plan to integrate this with PlanningCenterOnline! On a side note, they are great at getting back with you when you have questions or feature requests. This seems to be the same team who works on PlanningCenterOnline. Right now, that resource is getting most of the attention for development. However, Smart Events is a great start and better than anything else I have seen online. It is simple. Looks great. And was definitely built with student ministry in mind! Check it out! I recommend getting setup and using it for a free event to see how it all works. You might ask why people would register for a free event. Thanks to personal experience and wisdom from others, we found two ways to get families to register for a free event: prizes and games. 1) You tell students that you will draw a name from all those who register online by the deadline. Then, only those who registered online and by the deadline get a chance to win a gift card or whatever prize works for you. Those who didn’t qualify definitely will make sure they do next time! 2) Ever hate announcing a game only then having to pick from the screaming group who gets to play? On the registration form, create custom drop down lists of game choices. Allow students to pick their top three in order. Then, when you are ready to play the game, simply call out names from the lists you had ahead of time!